Love the music and the vinyl presentation. The 3D hologram is a showcase piece. Not necessary but at the same time, I can't pass it on. The pressing however, is not always the greatest. I can hear clicks and pops throughout the whole album, not often, but since I usually play the music really loud, I can hear it. But I don't want to return it because I love the music and the hologram so much. I guess I just need to accept that. Some people said that's what you get with a vinyl. But I refuse to believe that because I have some vinyls that have almost zero clicks and pops. I mean, what can I say about this record that hasn’t already been said. The holograms are great, and it makes playing the record that much more of an experience. It’s on sale, so get it while you can! The moving images are really so fun. Even as adults, my boyfriend and I giggled like children watching them! The music is obviously wonderful. It was such a fun gift. Very happy! As a huge Star Wars fan and a collector of such items, these were a must-have. The cover for the vinyl is beautiful and the vinyl themselves are one of a kind. Very impressed! These records blew me away! 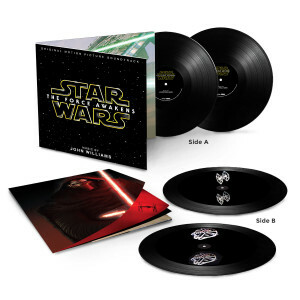 I purchased them as a Christmas gift for my wife, who is a huge vinyl fan and an even bigger Star Wars fanatic. Needless to say, it was a huge hit. It’s true, the hologram only shows up with properly directed lighting, and only on one side of each record, but it is still incredible how well it shows. My wife loves these. The sound quality is perfect and I couldn’t think of any way this product could be improved. A John Williams soundtrack deserves to be listened to on vinyl! Like most fans 2 years ago, i quickly purchased the CD/Download to media player. But after getting this vinyl set, the full depth of sound &amp; experience is amazing! The hologram logo is a cool touch but limited to having to shine a light directly down while playing. It's nice perk but real value is the sound that is delivered. Also, a very nice album cover with quality &amp; detail, and while the booklet is identical to CD, to have it vinyl size is great. Highly recommend for any fan of the saga or the composer!